April 2016 – Nickl & Partner Architekten Schweiz AG has been selected as the winner of the study contract for the new Baden Canton Hospital. The study contract for the building was prepared and submitted together with MMI Schweiz AG. MMI will also be part of the general planning team for the new hospital led by Nickl Architects. The judging panel selected the project design called “Agnes” as the winner among six participants. The hospital is the flagship hospital in the eastern part of the canton of Aargau, one of the federal states of Switzerland, which was built in 1978. After 35 years of intensive operation the hospital needs to be reconstructed now since it faces operational, structural, and technical deficiencies. Essential to the winning planning concept is a new hospital building, which is located in the immediate vicinity of the existing building. In the project design, the important functions and tasks are concentrated more efficiently than they are at present. The medical concept on this study was provided by MMI Schweiz AG. 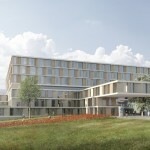 The cost for the new Baden Canton Hospital will be about 450 million CHF. The construction will start in mid-2018. It is expected that the new 400 bed hospital will be completed in 2022. Once it is operational, the existing main building will be demolished.